Mold releasant powder assures an easy release of any candle from any mold. For metal molds, use 1/2 teaspoon per pound of wax. For plastic or rubber molds, use 1 teaspoon per pound of wax. Mold releasant will not affect most colors or fragrances. Adds snow flake/mottling effect to candle. Number of flakes will vary depending upon the amount of oil in the wax and the amount of snowflake oil added. Start by adding 2 tablespoons to 1 pound of wax. This should give a scattered snowflake appearance. You may need to experiment a little more to find the right amount for how you blend wax and any additives. Yaley's non-toxic and bio-Ddegradable way to remove wax residue from Candle Making Molds and Tools. Also removes wax from fabric. Comes in a plastic bottle with a screw on cap. Keep out of reach of children. Caution eye and skin iIrritant - combustible. Stearic Acid (or stearin) raises the melting point of the wax mixture, making the candle harder and more durable. The standard mixture is 10% stearic acid to 90% wax by weight. 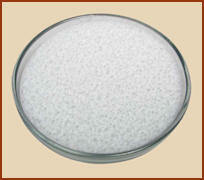 In lower proportions, stearic acid can create a snowflake or mottled effect. Higher proportions make the wax more opaque, with brighter colors. Candles made with this mix will burn longer with less drip and less sagging. These effects will increase as you increase more stearic acid. When mixed with stearic acid, paraffin will also slightly shrink away from candle molds as it cools, making the candle easier to remove. However, Stearic acid should not be used with rubber or latex molds. Vybar 103 is a wax additive primarily intended for use with freestanding candles. Add .5 to 2% to your wax by weight, or 1/4 to 1/2 teaspoon per pound. Vybar helps eliminate wax bubbles and mottling, and it helps with uniform dye dispersion (for even color) and a reduced number of surface flaws. For all that, though, Vybar's primary purpose is fragrance retention. Because of its chemical composition, paraffin only allows for a limited amount of additional oil (scent). The classic proportion is 1/2 ounce (just over 14 grams) per pound (454 grams) of wax. "Double-scented" or "triple-scented" candles carry one ounce (28.35 grams) or 1.5 ounces (42.53 grams) of scent, respectively. Carrying that additional amount almost certainly means that the candle has been treated with additives, most likely Vybar. In this case "a little is good" does not necessarily translate to "a lot is better!" With too much Vybar, the scent can become so tightly bound to the paraffin that the scent will be literally imprisoned within the wax and neutralized. Vybar works best with wax that melts at 130°F or higher, among our products, it's primarily used with AR143 paraffin.